Each SK-5235 is individually supervised by the SK-5208 FACP. When the system is normal andreceiving AC power, the power LEDis on and all other LEDs are off.Other LEDs turn on as theconditions occur. Users identify themselves to thecontrol panel by entering a code onthe annunciator. When a userpresses a button, the annunciatorpiezo beeps and the LCD promptsthe user to enter a code or otherrelevant information. Multiple users can work at differentannunciators simultaneouslywithout affecting each other. Maximum Wiring Distance: 1500 ft. 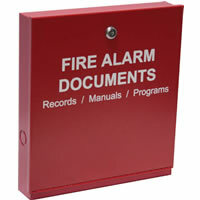 The SK-5235 remote annunciator provides remote annunciation for the 5208 Fire Alarm Control Panel.